We already had a currency war, and now a fresh new war seems to have started. After OPEC refrained from a production cut, Saudi Arabia this week offered customers in Asia the biggest crude oil discount the continent has ever seen. This is about market share! This week the ECB held its last policy meeting of the year. 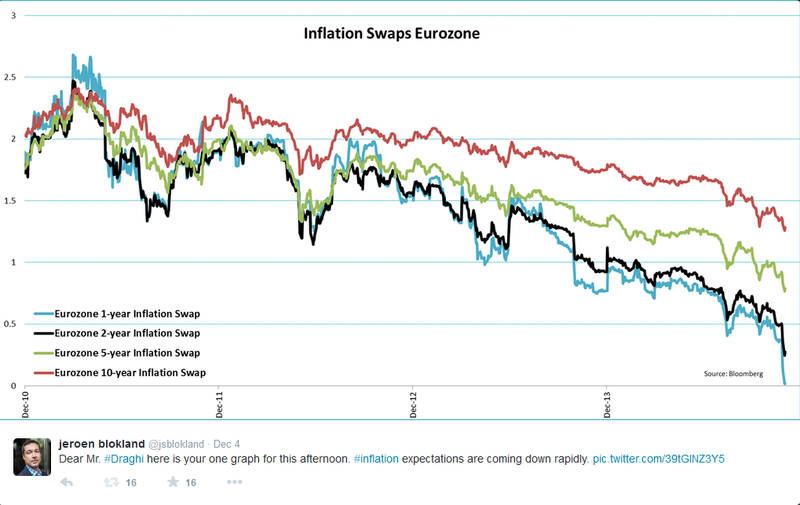 I guess the only chart Draghi had to bring to this event was the one shown below. Inflation expectations are falling rapidly, exaggerated by lower oil prices. But with an inflation target of close to, but below 2%, the ECB has made life difficult for itself. The ECB also presented an updated GDP and CPI forecast at this week’s meeting which, not surprisingly, revealed that inflation is going to stay lower for longer. For next year the ECB expects just 0.7% inflation, but, as Draghi immediately added, this does not even include the full impact of lower oil prices. Draghi did not yet announce QE, however. For at least another 7 weeks (until the next policy meeting) nothing spectacular is going to happen with the ECB balance sheet. The insignificant numbers involved in ECB ABS buying included. But QE is so close you can almost smell it. 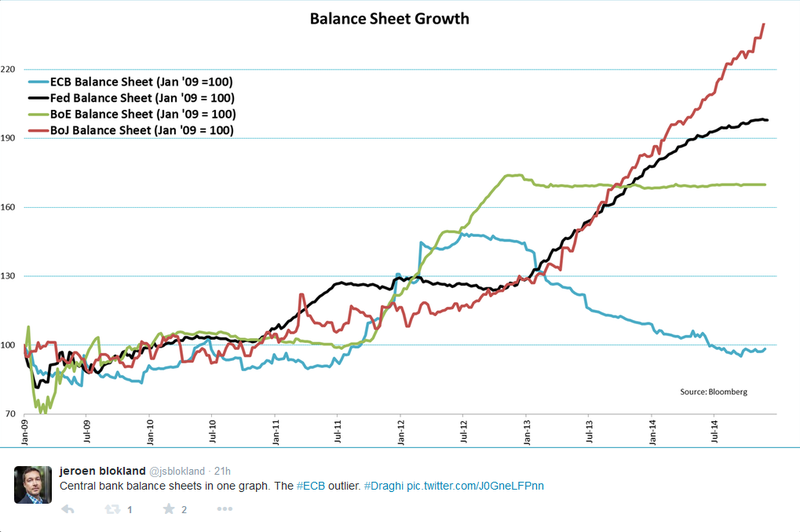 The carefully chosen words of Draghi no longer disguise the ECB’s real intention, to prop up its balance sheet. I am pretty convinced Draghi will announce some kind of QE stimulus soon. Meanwhile peripheral bonds are going through the roof. 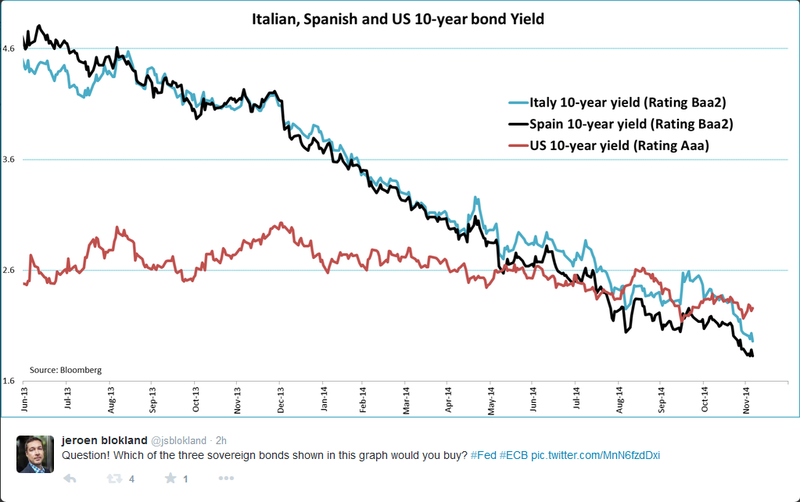 Yields on Spanish and Italian bonds are now way below those in the US. The divergence in monetary policy between the US and pretty much every other major central bank is impacting currency markets. 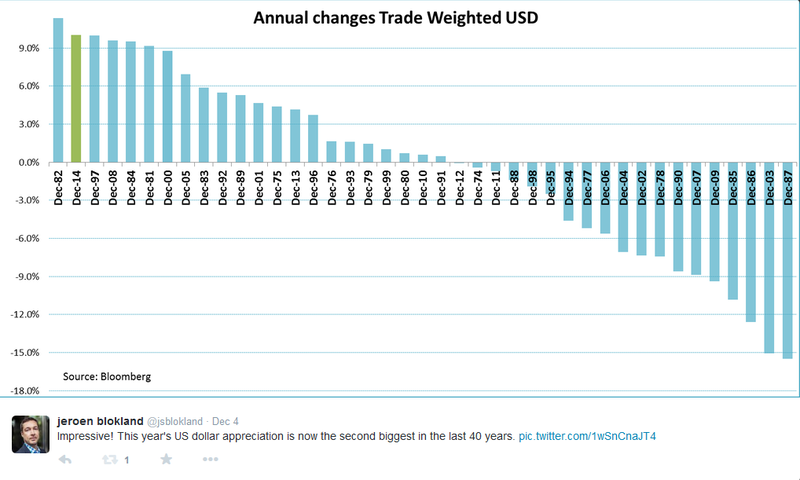 This year’s US dollar appreciation is already the second strongest in the last four decades. 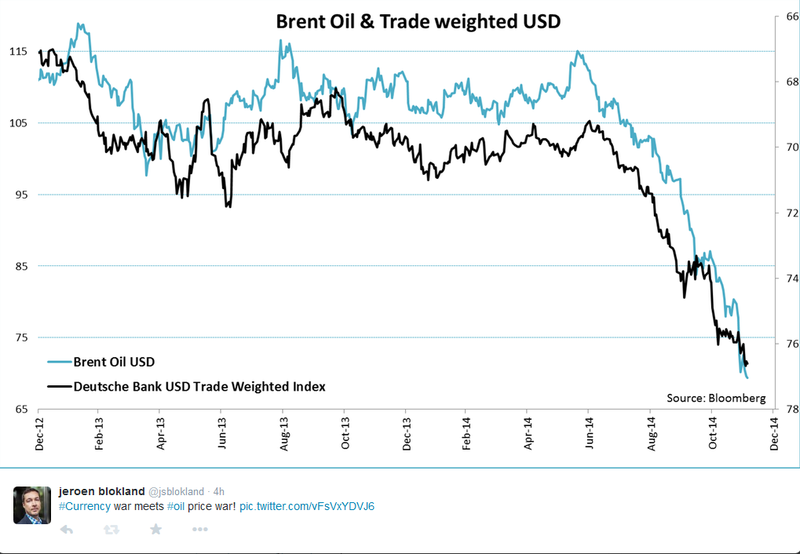 The trade weighted dollar has risen more than 10% so far. And we are not even done yet. 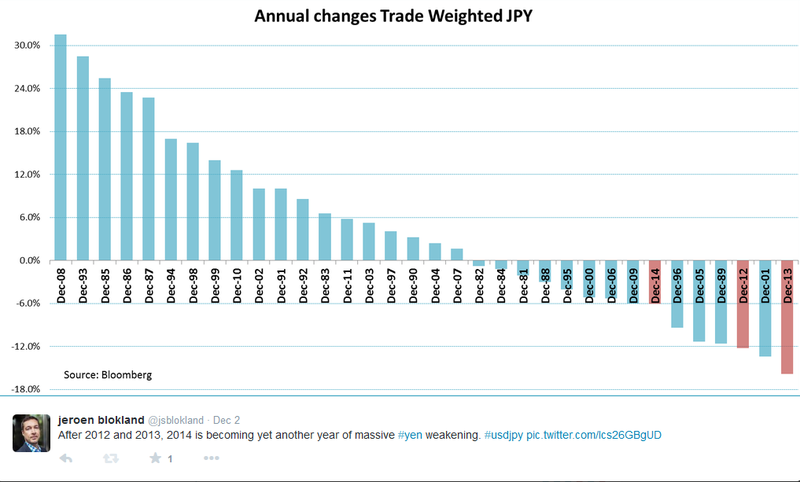 Perhaps the most telling story of monetary policy divergence is that of Japan and the US. With ease the USDJPY crossed the 120 barrier and when the nonfarm payrolls were announced 121 was gone before we knew it. Now, let’s move over to oil. The Economist provided yet another great cover that neatly depicted the new financial market war that has commenced. After OPEC’s ‘forgotten’ production cut, Saudi Arabia lowered prices for Asian customers, in an attempt to defend market its share. This could become long fight, where stamina is required. Who can deal with low or lower oil prices the longest? 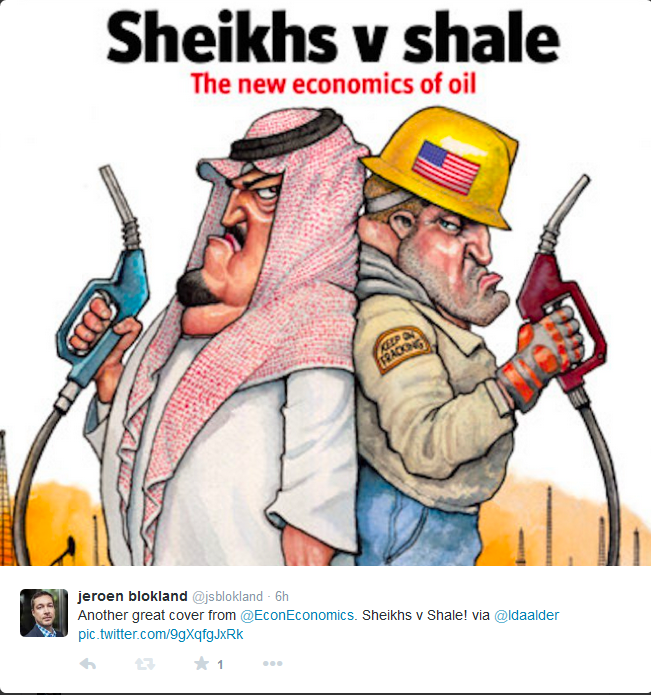 No discussion about oil is complete without Russia. The link between Russia’s economy and its currency is as clear as ever. 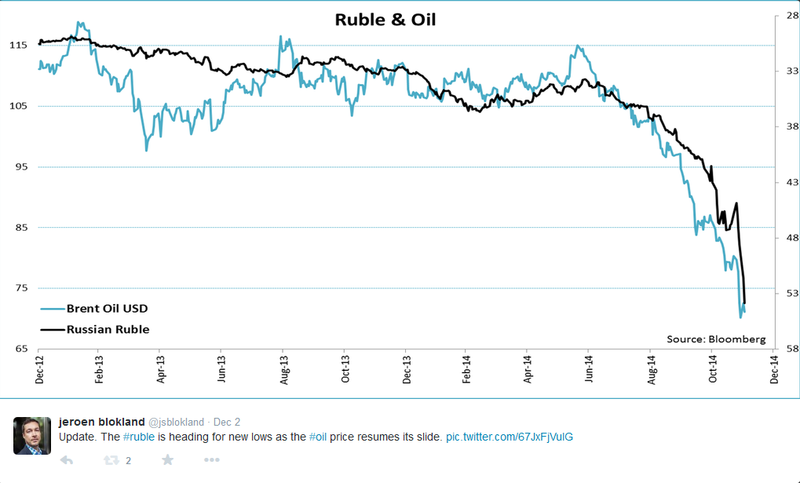 The ruble – oil correlation is probably the best example of that. The central bank is intervening, but keeping the ruble from a freefall has so far proved idle. 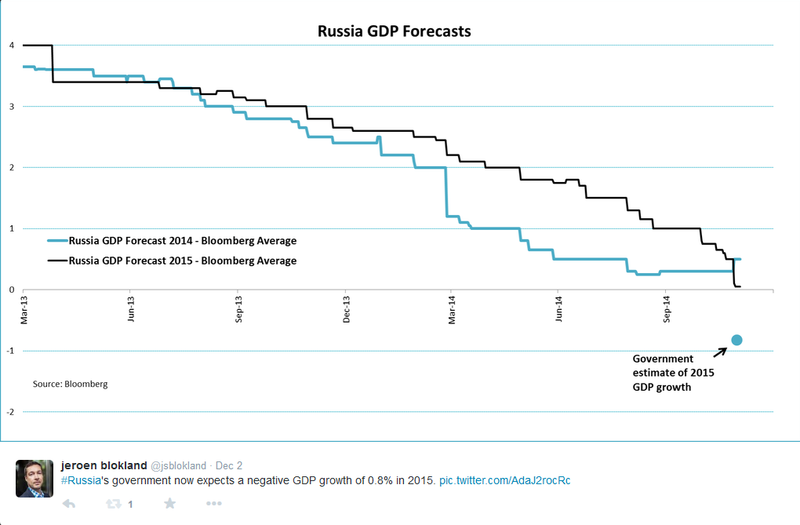 The Russian government expects GDP growth of minus 0.8% for next year. But looking at other indicators like the Russian Services PMI, things could turn out much worse. Inflation is already picking up, crossing the 9%-threshold again, and wages (especially real ones) are coming down. Sanctions will not be lifted anytime soon so a recession of just under 1.0% seems rather benign. For many others, low oil prices are blessing. Consumers, globally, will see their disposable incomes grow and input costs for companies are falling. 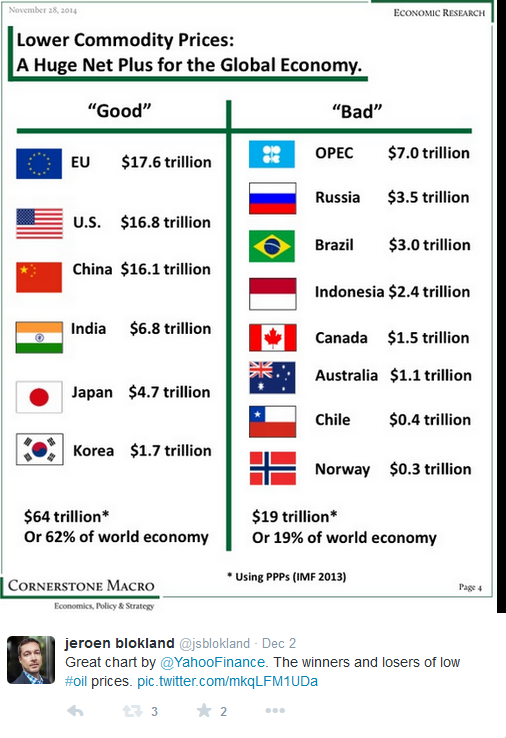 Below is a nice graph that shows that on a global scale lower oil prices do more good than bad. Heading over to China, briefly. 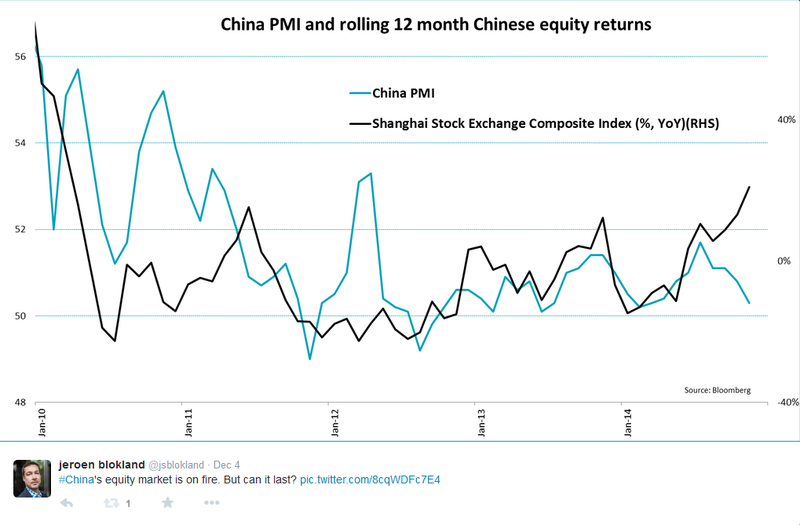 China’s equity market is doing really well in recent months. 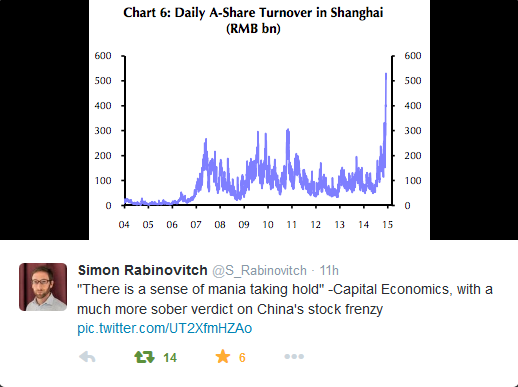 Ever since the Chinese market opened up for foreign investors things have been great. But the stock market party is not at all reflected in economic data. The PMI is barely above 50 and it could well be that investors are getting a bit ahead of themselves. Other data underpin this observation. The number of newly created investment accounts and the turnover in the stock market signal there could be a bit of a frenzy going on. Big returns are not being followed by big (macro) numbers. This Week End Blog goes out with a bang. The US job market crushed expectations with a rise in payrolls of 321K, the biggest hiring surge since January 2012. That is just really impressive. I have said it a couple of times before but I think the US is staging a real recovery this time that will last for some time. 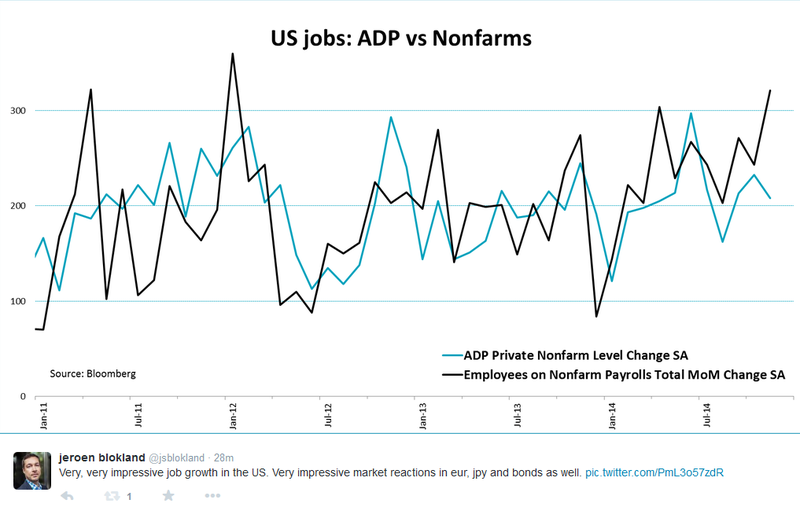 And , the November payroll data suggest it could actually be a bit stronger than most people think. Thanks again for reading, and enjoy your weekend. ← Week End Blog – OIL!